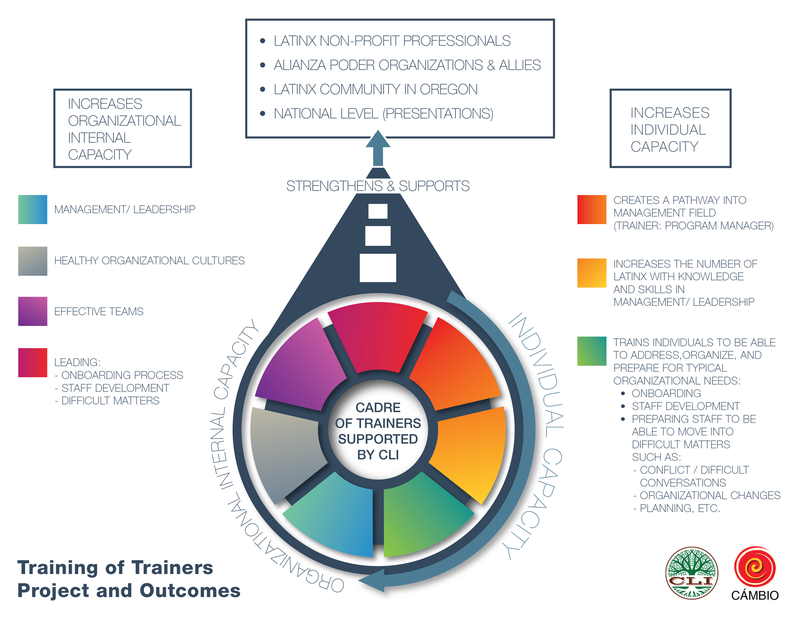 The Cambio/CLI Non-Profit Management Training of Trainers is a pilot project designed for Latino/a/x non-profit leaders interested in: (1) Learning to train others, and (2) Strengthening their capacity in the areas of management, organizational development, and leadership development. On top of the training, the participants will receive coaching and be part of a learning community structure that is maintained post-training so that trainers have a system that supports their continued experimenting and development. When is the project occurring? Why is the CLI offering this opportunity? Strengthening the capacity of individuals and organizations is integral to the CLI’s mission. In our experience working with the Latino/a/x community, most of the energy has been directed toward social services, and program design and execution – e.g. in organizing, leadership development, and more recently, civic engagement. This project will create a pathway into the fields of Management, Organization Development, and Leadership Development where there is low Latino/a/x representation. It will also strengthen our self-reliance by creating the foundational capacity to train others. The project will be led by Adriana Ballén of Cámbio. Adriana is a Colombian immigrant and has over 30 years of experience working in philanthropy and the nonprofit sector. She works with civic engagement organizations and networks to focus on systems change, organization development, group process, and leadership development. Additionally, Adriana has the cultural and language ability needed to successfully carry-out a project of this nature. The project requires a 1 ½ year commitment. For year one, participants are expected to dedicate two full days of trainings a month from June-October of 2019, bi-weekly one-hour coaching sessions, a few hours between monthly training sessions in a Learning Community experience and any follow-up work and commit to practicing and transferring the knowledge and skills acquired. Year 2 time commitment is still under development. The cost is free. The CLI is investing approximately $20,000 for each participant to have this experience (Cámbio is in-kinding a percentage of this cost).